It doesn’t matter who you are. September 11, 2001, will haunt you for the rest of your life. I wanted to pay my respects not just to Ground Zero’s victims, but to New York. Like a funeral service, you don’t know what to say, but you want to say something. I had to go, and so ion December 30, 2001, I did. I flew into New Jersey and took the train to New York. I was walking through the station to the street exit when I passed a long wall that was a memorial to New York and the victims. Posters from grade schools kids; photos (“Last seen at World Trade Center. If you have seen…please notify…”); a flower or two; poems; letters; hundreds of messages. I put my hand up and touched them, and felt the pain behind the pleas. 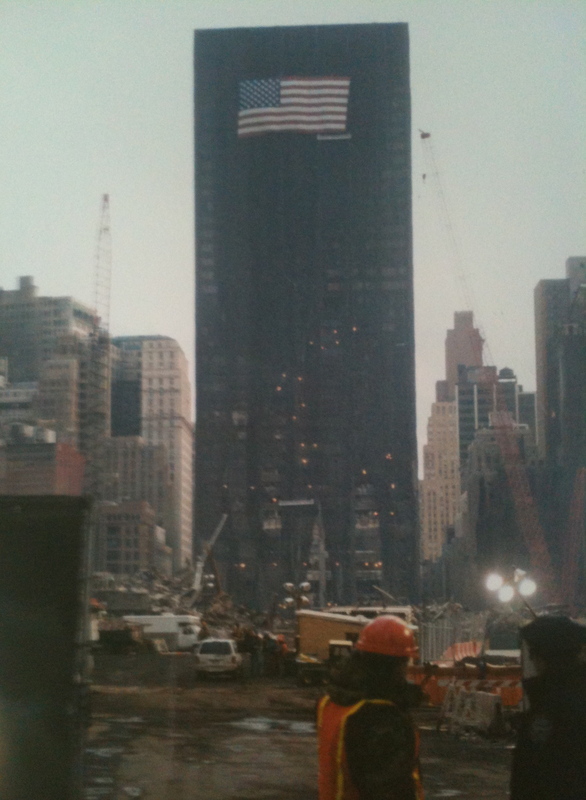 I checked into the hotel, set my bags down and headed for Ground Zero. The cab took me to within a few blocks but got stopped in bumper-to-bumper traffic. After getting directions from the driver, I got out and walked the rest of the way. Groups of people were walking towards the site and I slid in alongside them, into their purposeful, quiet rhythm. Police officers were next to the curb, trying to keep warm with a barrel fire. I paused when I saw red, white and blue wreaths adorning an overpass. I paused when I saw a fire department door with a sign thanking New York for its support. I paused when I saw red white and blue ribbons tied on an iron fence. I paused when I saw flags on balconies, in windows, on buildings, on police cars and fire trucks. It’s one thing to see flags displayed here in the Midwest, it’s another thing to see them in New York. You know when Ground Zero is around the next corner. All of Manhattan is closed in with buildings, tall, taller and tallest, until then. Suddenly, you look ahead and see a wide space of sky and you know. The openness is eerie. I walked alongside the barricades that were used in the first weeks to block off the street, but are now moved aside. You can hear the cranes and trucks before you see them, and slight wasps of smoke from debris still smoldering. There’s a slightly unpleasant odor in the air. Police vehicles are parked everywhere. The site was barricaded off, with police directing pedestrians and authorized vehicles. A corner of the barricade was covered in photos, flowers, notes, wreaths, candles, and stuffed animals. There was even a Christmas tree. The people moved in, paused, took pictures or prayed or cried or all three, and moved away. I heard someone behind me say, “The photos are hard to take.” The faces of real people, real losses. A tall building opposite where I was standing was blackened and charred. The building to the left of me had it’s corner blown out. The building to the right had boards where windows once were. There was an opening in the barricade that allowed you to see a portion of the site. Daylight was beginning to disappear and huge lights were shining on the wreckage. I could see a crane, digging. I turned right and moved to the next block. A crew of rescue workers were going in. Trucks were lined up to leave the site. Tall, massive showers were built to wash down the vehicles before they exited. A flatbed piled high with debris drove past me. Twisted, mangled debris that I had no idea were cars until I saw the tires. Another truck passed me. They were taking the debris to the landfill site, where searchers would sift through it for human remains. There were trucks stopped down the block and lined up to the right, waiting. As a truck would leave the site, another, empty one would start up and take its place. The trucks never stopped leaving, never stopped arriving. Over and over, lines of trucks, 24 x 7. It had turned dark and cold. I started heading back, choosing to walk on the same street where thousands had run for their lives that day. My psyche went backwards in time. I felt the fear that had blasted down the streets; heard the noise that overpowered the senses. With each step I wondered who had gone before me. I prayed for them and their families. I wanted to touch something, to feel something beneath my fingertips, anything to get the message to my brain that this was true, that an evil so great existed on my homeland long enough to cause a century of pain and tears. Why, why, innocent victims? Why, why, the evil madness? The next day I struck out again. One of Mayor Giuliani’s last accomplishments was the opening of a public platform that morning at Ground Zero, and I wanted to go back. But first I needed to see something else. I walked from mid-town Manhattan to Central Park. I’ve been to New York before, I know the cold reserve and rudeness for which New Yorkers are famous. But that’s not the New York that survived September 11. There are those tourists with cameras and accents or a language different from the native-born New Yorker, who kept to the themselves; and, there were the teenagers or young adults who were totally absorbed in looking cool, as we all were then, who kept to themselves. But loads of others — doormen, clerks, waitresses, walkers, police officers, shoppers — whose kindnesses were profoundly evident. A smile here, a nod there; a “pardon me,” an “it’s that way” with a smile and wishes for a happy new year. It was like being home in the Midwest. 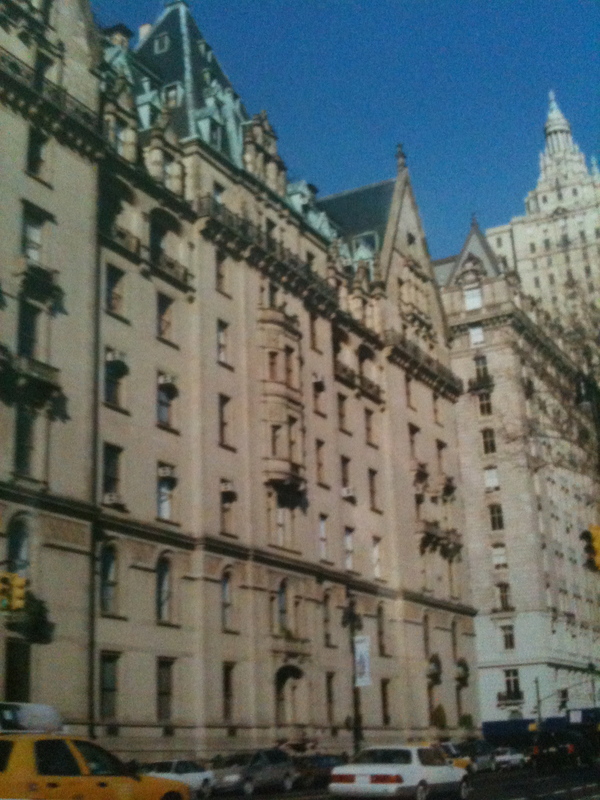 I found the Dakota and went past the doorway where John Lennon was shot down, which sickened me. 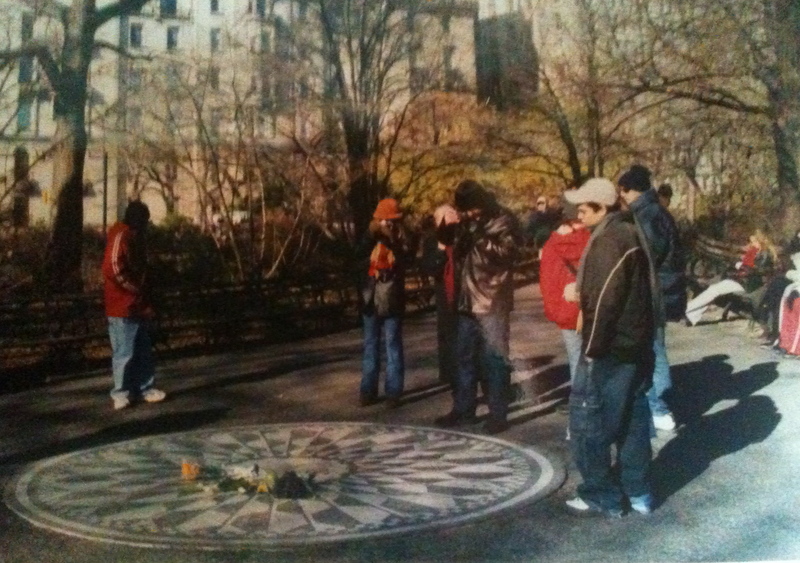 I crossed the street to Central Park to the mosaic memorial in Strawberry Fields, which made me feel sad. I sat for a while and watched others pay their respects or take photos. Before I left, I took off a glove and touched the mosaic. I thought of the Beatle years and smiled. Nothing could kill that. I thought of September 11 and wondered what had survived for us. I strolled through Central Park where dogs chased rubber balls or children twirled and laughed with the pigeons; where lovers walked, absorbed in themselves and the bright light of the winter sun in the afternoon. How could so much evil exist in a world of such beauty? I walked back through Times Square where the New Year’s ball was being tested and hoisted, engraved with the names of the fallen rescuers. Massive amounts of people were crowding into the area, working their way around the police vans and trucks, amidst the security personnel checking the area. Then I went back to Ground Zero. By the time I arrived, darkness was falling and the wind was making the air incredibly bitter. The line for the public platform was stretched for two to three blocks. The crowd was being informed that the average wait was 3½ hours. I strolled on the street instead, which was partially barricaded from the traffic. City Hall was nearby on the left and the St. Paul Chapel and Cemetery was on my right. The church shouldn’t have survived, but it did. It’s the city’s oldest church, dating back to the inaugural of George Washington as president. Despite all odds, it was still there for the rescue workers when they placed the body of their fallen chaplain on its altar. The iron fence in front was covered in flowers, wreaths, signs, candles. One sign stood out, asking that no photographs be taken of the rescue workers, out of respect for their privacy: they visit the church during their breaks. I reached the public platform and stopped. Only a small group of people are sent up at a time, but each group is allowed a few minutes before the next one is sent up. People didn’t talk when they came down. I looked up at the tall buildings still standing near the sight, knowing the towers had dwarfed them. If they had fallen to the left or to the right, the destruction would have been immeasurable. I headed back, scarf around my face and my gloved hands buried in my pockets. Vendors were scattered throughout the area selling hats with FDNY, NYPD logos, peanuts, and pretzels. So New York. Why does evil live as one among us, a dark purple bruise of pain next to the yellow smiles and red hearts of beauty? I don’t get September 11. I want to get it. To get something. I was glad the church had made it through the attack. It reminded me that we are in two worlds: one that was created for us, one that we create for ourselves. Life is a dance, partnering the two worlds. I saw in New York, in all of us, a yearning to dance in rhythm with each other, to music greater than ourselves. Why does evil exist? Not why, but when. When the dance step is not accepted, when the beat is not followed nor heard nor felt. When what could or should be done is not. When an act of kindness or the gesture of goodwill is skipped, and room is made for the uninvited guest to live as one among us, until it eventually destroys us. Our hearts are like Ground Zero – there’s an empty space that haunts us. If we fill it up with thoughts, actions, people, and events of good report, there is no room for unwanted guests. The world is still good. Good is still powerful. I left New York the next day, but not before I signed my name to the memorial wall. When you’re a kid living dirt poor and struggling, about the only thing worth remembering is your mother’s smile. My family lived in a small eastern Iowa town, near the Wisconsin and Illinois borders. Mom and Dad were raising us three kids in a five-room, cold-water flat they had rented. A commode had been installed under the stairs when I was four, but we hadn’t worked up to hot water yet. That would take another decade, and another house. Like her mother before her, my mother had a hankering for pretty things, though she rarely got them. She especially liked the idea of special dishes just for company, to show her visitors she thought highly enough of them to get out the good china. An extra set of dishes beyond our daily ones, though, was well out of her barely-there budget. In the early 1950s, Procter & Gamble produced a boxed powdered soap called “Duz” with the tag line, “Duz does Everything!” claiming the soap worked even in the hardest water. It was the company’s promotional gimmick, though, that got my mother interested: the company was offering a set of china dishes absolutely free! One dish item, white with a golden wheat pattern and gold edging, would be placed in the box of Duz in a specified order, eventually providing the loyal and dedicated shopper with the complete set of china dishes, good enough for company…or so figured my mom. Faithfully each week, she returned home from her grocery shopping in an excited flush, eager to add to her growing collection of “best china.” On one unusual day, I was a particularly well-behaved little girl. For a reward, Mom allowed me to pull out the prize. The cardboard box was rough and strong, so I ripped off the top with a hard yank. “Careful! Careful! You don’t want to break the dish!” Mom admonished. I slowed down. I didn’t want to smash anything so precious as Mom’s special dishes. I reached my small hand much more carefully into the box. Mom stood eagerly by, waiting, while I continued my quest for the buried treasure. The soap was grainy, feeling like the stuff could be fun if were something you could build forts with. But it was soap, and if I didn’t wash it off my fingers, would have it in my eyes and mouth and, as everybody knows, would sting and taste bad. My fingers soon hit upon something smooth and hard. “I found it!’ I said excitedly. I gripped it and started to pull my hand out when Mom shouted, “Don’t get the soap all over!” I stopped in mid-box, then resumed a straightforward pulling action, ignoring how the cardboard side was scratching my wrist. I got the dish to the top and saw that it was a cup. “Pour out the soap first!” my mother instructed. I walked to the counter and set the opened box down. I turned and looked at Mom. She was still busy fussing with her growing “company” dishes. Eventually, she did acquire a whole complete set for eight, with a few extra, and rolled out the dishes proudly whenever company came and she wanted to set a pretty table. I’m pretty sure she never once used the soap for her laundry or the dishes. As the decades passed and with both my parents gone, I began to think often of my childhood. Mom, Duz soap and her dishes, would always come to mind. As I collected my own sets of good china – not out of a detergent box, thank you kindly – I found myself unable to stop wondering what had happened to those “company” dishes. None of my siblings, I knew, were interested. I browsed antique stores, hoping to find a cup and saucer, or a plate. But, I had no luck. 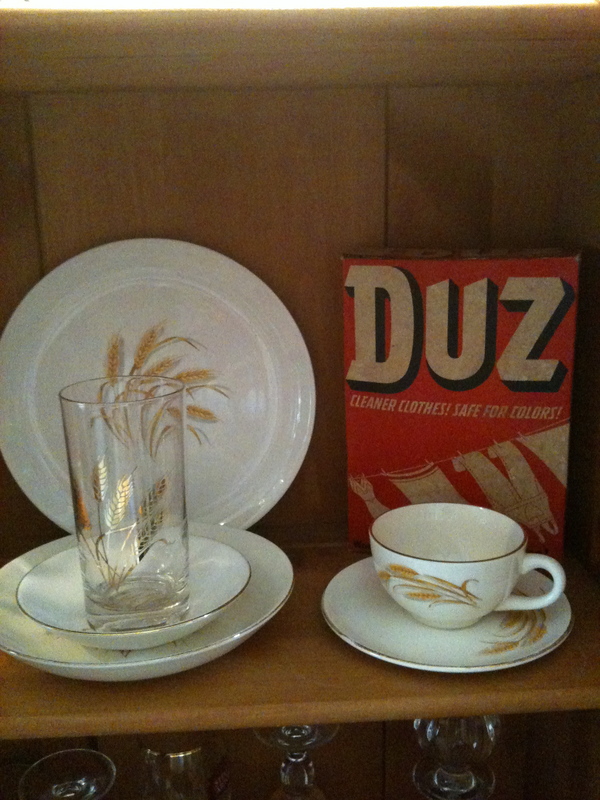 In time, I forgot about the Duz dishes with the golden wheat pattern. Last spring, an unexpected package arrived for me, marked “fragile.” My honey had ordered me something as a surprise. I smiled. He was always doing cool things like that. I carefully cut the tape and opened the box, seeing that it contained a few things wrapped in bubble wrap. I reached in, avoiding getting my arms scratched on the flaps of the box, and pulled out the top item. A bit of gold edging peered through the bubble wrap. I knew it was a plate….but it just couldn’t be that plate! Forgetting about the “fragile” part now, I hurriedly tore off the bubble wrap. There in my hand was a miracle: one of my mom’s plates, with the golden wheat pattern and gold edging. When every item was unwrapped, I stood back and stared at the dishes. I had unearthed a matching platter, two bowls, a cup, a saucer, and a drinking glass. Memories of my mom proudly serving her food on these special dishes washed over me. There was no way these could have been hers, but then again…they could have been. I fingered the golden wheat stalk on the plate. I traced the gold around its edge. I lifted the cup, remembering the honor I had been given of pulling one out of the box of Duz. I washed the dishes and set them on a shelf in my hutch. A few weeks later, through the wonders of online bidding, I acquired an unopened vintage box of Duz, and set it on the shelf next to my dishes. I stepped back and viewed the ensemble. It wasn’t just soap and a few odd dishes I was seeing: it was my mother’s smile; her little bit of beauty in a harsh world, gathered painstakingly piece by piece, week after week – a reward for her persistence and patience. That little box of Duz soap proved to my mom that no matter who you are, or what station you serve in life, your dreams can still come true. Like the one I had as a little girl, seeing my mom standing tall and looking people in the eye with pride. At least, as far as I was concerned.